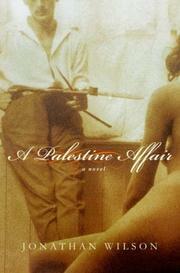 After a bizarre murder, the powder keg that is 1920s Palestine threatens to explode. Writing a thriller masquerading as a literary novel, Wilson (The Hiding Room, 1995, etc.) hurls us right into the thick of a Palestine still healing from the wounds of WWI, chafing under British rule, and fast swelling with Zionist activists. All starts off on a beautiful summer night that’s shattered by the murder of an Orthodox Jewish man inexplicably dressed in Arab garb. Witness to the killing are Mark and Joyce Bloomberg—Mark a Jewish painter who’s been drummed out of the London scene by scathing reviews, and Joyce an American gentile dilettante with a strangely fixated devotion to the Zionist cause. The third side of this triangle is Robert Kirsch, a British policeman who is just as blase about his Jewish heritage as Mark is, and also just as attracted to the nervy, live-wire Joyce. Kirsch’s superior, an old-school, stiff-upper-lip type of the most enjoyable sort, proclaims himself a fan of Mark’s work and hires him to head off into the Transjordan to paint, conveniently leaving the door open for Kirsch and Joyce’s doomed affair. As often happens in books where writers have a larger agenda than simply puzzling out a crime, the murder investigation quickly becomes a quite desultory affair, with the primary suspect—a young Arab boy who may have been having an affair with the victim—being hidden from the cops by those who would prefer Jerusalem not explode in riots upon his arrest. What really interests Wilson, and reasonably so, is the ambivalent nature of the newly arrived Jews in Palestine, the barely concealed disdain they’re held in by the stretched-thin British authorities and the razor’s edge all of them walk. Just the right mix of psychological incisiveness and historical drama: a bold story of displaced people and misdirected passions.